We received this doll for our daughter's birthday. 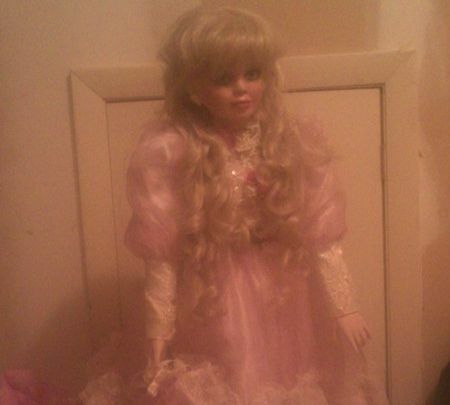 It freaked me out from the sight of it so we put it in her ''secret'' room aka the closet with the attic entry. So the whole room is possessed. We don't know if it's the doll or the attic or both. We turned the doll facing the door because it just freaks me out. It's a life size porcelain doll. My room is under the ''secret'' room. All night we hear little pitter patters across the ceiling. When I went up there I got a sick feeling. Our daughter was sound asleep. We went back downstairs and the footsteps started again. I refuse to go upstairs at all now. I can't get rid of the doll because my daughter loves it. Hello. I live in Mount Olive and your story has intrigued me. I do believe there is a spirit inside of your daughters doll. Get RID of it as soon as possible! It doesn't matter if your daughter loves it. What's more important? This doll has a demon attached to it and you need to dispose of it ASAP! There is no room for sentimental attachments to it!. Ok so if you hear noises and the doll is life sized, the doll is probably possessed. You really need to go back to where you got it and ask about the history of the doll. You never know, it may be a doll of a deceased child or doll collector. If this continues you need to cast the ghost out. To do this you need frankincense and sage. Burn this in your ''secret room'' while chanting the Lord's Prayer. I hope this helps. I'm Brandy. I live in Goldsboro NC in a haunted trailer. I believe in ghost, and I believe you. My ghost turns my sons TV off and walks around. You can hear footsteps like it's a person knocks stuff over off my fridge. It also moves things, and things just disappear. My husband and I both experienced it. It also messes with my cat. I am the case manager with paranormal chasers located here in Wayne County. We can be found online at www. paranormalchasers. com our goal is to offer our clients answers to their questions as well as provide a thumb drive to the client with the evidence collected. Please email or call us we would be happy to assist you. :-).